Three new drum mics that are far removed from a 'mic set for £99' - precision instruments that deliver pro-standard sounds. Superb sounds: thunderous bass and clear, crisp highs. Excellent build quality. Good value, given the quality. Sontronics' first production drum mics have so far received plaudits from industry heavyweights and journalists. These three models - DM-1B for bass drums, DM-1S for snares and DM-1T for toms - spent nearly three years in development. Sontronics was founded in 2004 by musician and audio expert Trevor Coley. Since then, the Poole-based company has established itself as a manufacturer of professional audio products that combine innovative designs with realistic prices. Where a lot of manufacturers prefer the robustness of dynamic mics for drums, Sontronics' three new models are condenser mics. Tough though they are, dynamic mics are less sensitive and don't react as swiftly as condenser equivalents. "Sontronics reckons it has packaged the superior sonic attributes of condenser technology within a sturdy casing resistant"
Being something of a specialist in condenser mic design, Sontronics reckons it has packaged the superior sonic attributes of condenser technology within a sturdy casing resistant to the knocks and scrapes that are the reality of a mic's life. The DM-1B bass drum mic is as solid a piece of kit as it looks. Housed inside its nickel-plated body is a large diaphragm capable of dealing with sound pressures of 155dB. The diaphragm - which is end-fire, meaning it collects sound from the front of the mic rather than the sides - is visible through the extensive grille. The casing is suspended in a yoke-style shockmount, whose knurled nuts allow for positioning variations. A standard female thread in the nut at the bottom of the yoke means that the mic can be attached directly to a mic stand. Looking slender and petite alongside the DM-IB are the DM-IS and DM-1T mics. Like the DM-1B, they require a phantom power source (an option found on any mixing desk) to function. 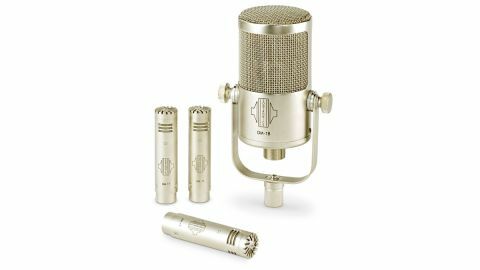 Although housed in identical casing, the two mics are designed to accentuate the frequencies of their respective drums. Both mics are supplied with a clip mount that attaches to the rim of a drum, so avoiding the necessity of a mic stand. Sontronics spent much R&D time evaluating the sound characteristics of the individual drums that make up a kit. This research means that the new mics are effectively pre-EQ'd to capture the relevant drums with minimal interpretation at the mixing desk. When we tested the mics in a live setting this was the case, as nearly all of the mics were run with zero EQ corrections. We say nearly, because the soundman actually had to dial a little bottom end out of the bass drum channel. This is unusual, especially considering our modestly-sized 20"x14" bass drum. The greater sensitivity of condenser mics was also apparent, with a minimal amount of gain from the mixing desk required. The drums had an excellent presence in the mix and the balance between attack and body was well struck. "A fat punch was at the heart of its response, making the drum sound as though it was leaping from the speakers"
We were keen to try the mics out in a more controlled recording environment and luckily our local studio obliged with some time. Simply plugged in and placed in front of the kick drum, the DM-1B delivered a huge sound with no EQ. A fat punch was at the heart of its response, making the drum sound as though it was leaping from the speakers. Alongside the power, the tone of the drum was reproduced faithfully as well - you could almost feel the air moving with each stroke. Brief experiments with mic placement found variations from pummelling deep, dry, dance-style sounds to more ambient but equally thunderous 'When The Levee Breaks' territory. The look of total exaltation on the sound engineer's face was matched only by that of dismay when it was time for us to pack the mics up. The DM-1S and DM-1T gave accurate portrayals of their respective drums. Snare drums require clarity and the DM-1S gave a crisp and bright rendering of a metal-shelled drum. Plenty of body was present too, fleshing out the sound. Meanwhile, the DM-1T conveyed the warmth and depth of the toms alongside the initial snap of skin. Both mics were exceptional at coping with changes in dynamics and could pick up the gentlest of touches. Despite being a relatively new company Sontronics has built a reputation for audio excellence. These three new drum mics are far removed from a 'mic set for £99' - they are precision instruments that deliver pro- standard sounds. Pre-release testing carried out at some of the biggest studios in the country saw them competing favourably against mics costing several times (in one case 10 times) their price. While investing in all three requires a fair amount of commitment, what is the point in spending hundreds, if not thousands of pounds on drums and cymbals and then compromising on the quality of microphone?